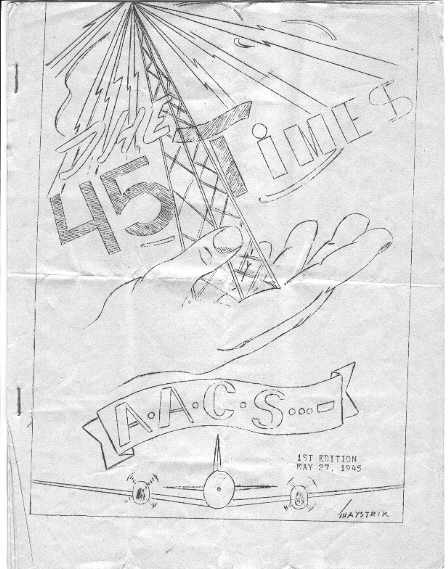 Amongst the papers of Philip Sturm, I found a copy of "The 45 Times," a mimeographed newspaper prepared for the members of Detachment 45, 142nd AACS Sq on Biak. It seems, at least for this issue, my father was the editor. The paper is well worth studying as it contains a history of Detachment 45, a biography of their commanding officer and a number of articles which give you a sense of the mood of the men on Biak in May, 1945. The paper is impossible to scan, so I transcribed it, making minor corrections to spelling. I purposely left out hyperlinks so for photos of Club 45, the Coral Coffee Corner and the crypto/teletype room, see the photos section. The Cover: The cover artwork by Sgt. Gerald Maystrik. Radios, Planes and Men: A history of Detachment 45. 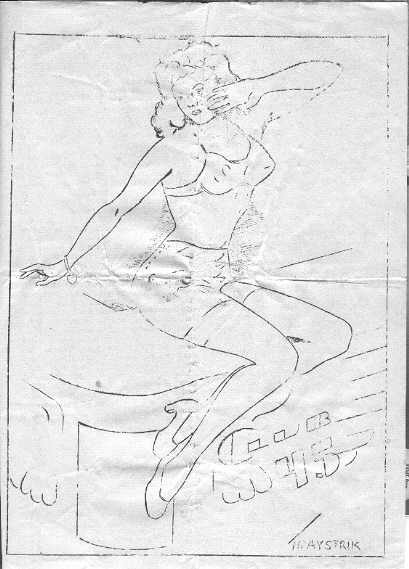 Pappy Speaks: Gossip and news about Club 45, the Enlisted Mens Club. The Sports Page: Local sports news. The Back Page: The back cover artwork by Sgt. Gerald Maystrik.